The Perlick HP24TS-1R2 has redefined the residential undercounter beer dispenser market. Since their inception in 1917 in Milwaukee, Wisconsin, Perlick has evolved into the premier supplier of refrigeration and beverage dispensing equipment in the industry. Perlick equipment can be found in restaurants, hotels, stadiums, theme parks, breweries and the finest homes worldwide. Made in the USA, Perlick residential refrigeration products have clearly set the bar in luxury home entertaining. The luxury of enjoying a draught beer at home achieves a new level with a Perlick Beer Dispenser. Since before Prohibition, Perlick has been making commercial beverage dispensing equipment. 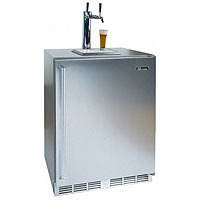 Perlick's 24-inch Signature Series Beer Dispenser has a 5.3 cubic foot capacity that can accommodate one 1/4 barrel or two 1/6 barrels (Will NOT hold full size keg or 1/4 slim).